These whimsical earrings are the creation of Thai jewelry artisan Pichaya. She creates the outline of a cat in polished sterling silver and suspends it on silver hooks. The result is a delightful pair of earrings you'll want to wear every day. 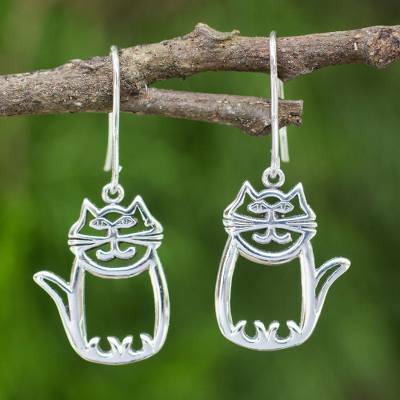 You can find sterling silver dangle earrings 'Whimsical Cat' by Pichaya in jewelry categories such as Animal Themed Earrings, No Stone Earrings, Silver Earrings, Sterling Silver Earrings and Dangle Earrings. Enjoy exploring these sections for other Novica treasures. These are cute and fun to wear. Love them. What a fun pair of earrings! They are well-made and not too big or too heavy on your ears. Every time I wear them someone notices and tells me how cute they are. Plus I love cats so I'm very happy with this purchase! Love the self-satisfied smile on these cats' faces. Their expression is just like a lot of cats I know. Fun to wear. Most jewelry is similar in style and appearance. This cat is very cute & gets attention ! Love these earrings with their "Cheshire Cat" grins. They resemble my cats Velcro & Fudge! I wear them all the time. I'm a fan of Pichaya's creations, for sure. I purchased these for my son's girlfriend (who loves cats) for Christmas. Can't wait to see her open the package. I purchased the earrings together with a necklace as a gift and I'm sure my friend will love them since the workmanship is great and the personalized message from this wonderful artist makes it even more special! Thank you so much for the quick shipment! I could not be happier! I got these for my wife for Christmas. They are simple and beautiful. Very high quality. And the packaging delighted my wife. "Perfect Gift for Cat Lovers!"